I never tire of reading Paul Krugman. But I have grown tired of America politics since the last election, because Republicans had apparently learned nothing. That pig is never going to sing opera, no matter how much I want it to. So, I almost don’t care what happens in the midterm elections next month. Almost. Because I understand what is at stake. 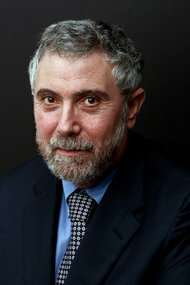 As professor Krugman points out, this has been one of the fastest economic recoveries from a major recession in United States history–and this has happened in spite of every Republican attempt to stifle an economic recovery. Spending is not the problem. It never has been. It’s the lack of spending, stupid. Konigludwig; I have heard more than one person make that statement . This breaks my heart because we need a massive turnout this midterm to change the gerrymander system. I voted early this year. I hope and pray others Vote but the base of the Democratic party is broken which was what the GOP worked for..
Hello, my friend. Good to hear from you. I didn’t mean to suggest that I don’t care at all. But if people are stupid enough to reelect Brownback or McConnell what can you do? No, I’ve been a Democratic partisan for a long time. I care very deeply about the direction of this country and the conditions of life for average working Americans. I’ve contributed more money to the Democratic campaigns in this election cycle than in any before. We’ll be voting early for the first time in my household. The economy is showing a solid recovery in progress. I like our chances in November. Republicans ran campaigns based on opposition to President Obama. There’s not much left for them to oppose. In this election and in 2016 they will have to run on their own merits. They don’t have much to run on. I heard tonight that Missouri sent out their early voting ballads but they changed to laws. All the early voters will not be counted. The state refuses to spend the money to correct the misunderstanding. The state citizens are voting already and they will not be counted. I do not know how they could do this. That makes me worried because I just voted via early voting ballad in the deep south. The cheating on the right has me worried. Now I will have to call the Supervisor of Elections to verify that my early voting will be counted. Did anyone else hear that report about Missouri?